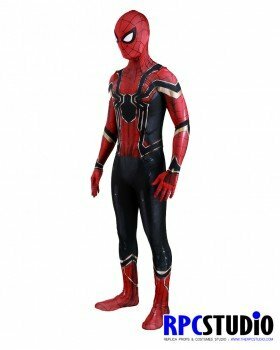 If you’ve seen any of the Spider-Man films, and you’ve found yourself wondering how you can get your webs into your own Spidey suit– then look no further. 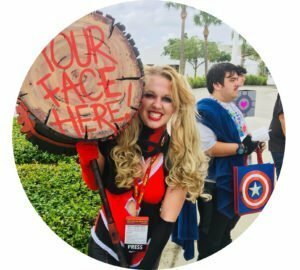 The RPC Studio is one of the cosplay community’s most reputable suit-makers on the block, and chances are, you’ve seen your favorite cosplayer sporting one. The RPC Studio offers over 100 suit options for both men and women. From the newest Spider-Man design that will appear in Avengers: Infinity War to Gwenom, it’s almost hard to choose just one! This is the first step in purchasing your own Spider-Man suit. You can browse through the RPC Studio’s Instagram for inspiration in deciding which suit calls to you. You can also select a custom suit from your favorite designer such as Brandon Gilbert. After you purchase your custom design (most sell for around $40), send the file to the RPC Studio for professionally sewing and detail. Have you ever had to give measurements for a suit? A tux for a friend’s wedding or a dress for your high school prom, perhaps? Well that’s what this step is for– except in a lot more detail. 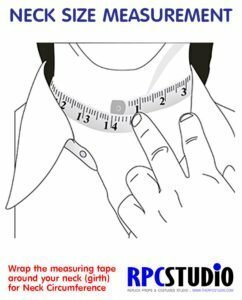 Not only do you need to know your chest, waist, and hip measurements, but you also need an accurate number for your neck, head, and height. Thankfully, the RPC Studio provides picture demonstrations on how to get the correct measurements for each area. You will also need to provide your most precise weight and and shoes size. All measurements can be given in feet, inches, or meters. 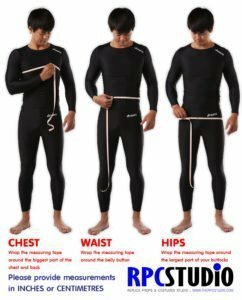 This helps the RPC get you a suit that is form-fitting and comfortable at the same time. Now for the fun part– adding details. 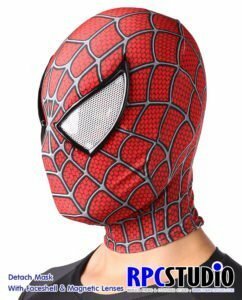 You can choose to get a suit without a mask, or as a detachable mask (seen above), with no price difference. 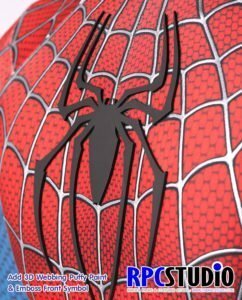 However, if you want those cool Spider-Man lenses, you have to chip in for the added detail. And if you want to be able to remove the lenses themselves, that’s a little bit extra as well. As for the lenses, you can choose to have fog-free lenses or the glossy version you see in these photos. Depending on the suit, you can also add claws, shoes, and zipper options. All of their zippers are seamless and invisible, adding to the overall movie-quality effect. If you get a classic Spider-Man suit, you can also choose how vibrant you want the central front symbol to appear (i.e. with or without puffy paint). And that’s it! A simple, albeit tedious process that ensures you will get the best cosplay on the market. The RPC Studio suits are 100% customize-able. They are made of breathable spandex, bright colors, and movie-quality details. It doesn’t matter where in the world you live; RPC Studio ships world-wide and they even offer a generous payment plan option. Suits are also available for print only, allowing you the fun of sewing the suit together! Tag the @RPCStudio and @CosplayandCoffeeNews on Instagram to be featured in your Spidey-suit! ← Cosplay Amino App With Cosplay Amino Fans!